Prepare a bowl / container size is rather large, put all the ingredients except meises and cheddar cheese, then mix together. For better results, better terigunya sifted flour first. After that, stir the batter until smooth and slick using a whisk. If there are bergerindil in batter, please screened. Pour batter into a mold that has been heated and greased beforehand, cook with small fire, then close the mold. 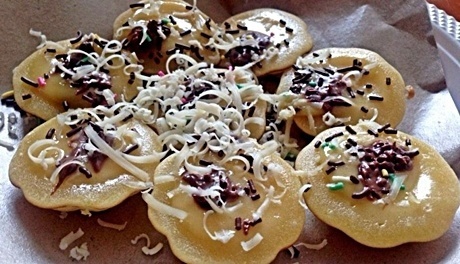 After a half-baked, sprinkle with meises and grated cheese on top, then cook again until cooked. If it is cooked, remove the cake and serve while warm. The pinch cake so delicious when served in warm conditions. By using this recipe, I hope you managed to make a cake pinch perfectly match your expectations.